If you were thinking about giving a personalized BEQ crossword for Christmas/Hanukkah/Kwanzaa/Pagan Festival of Lights/etc. to your husband/wife/fiancé(e)/neighbor/boss/son/ daughter/grandmother/etc. and you still haven't hit me up yet, please drop me a line this week. We'll still have plenty of time, but I'd like to plan out the rest of the month. Thanks. Also, I was unaware that the last BEQ Fan du Jour (Tuning Spork) wrote and posted some puzzles himself. If I had known, I would have linked to it last Friday. No matter, better late than never. Go now. Too many puzzle links? I think not. Two more: Matt Gaffney's contest puzzle from last Friday might be one of the nastiest, hardest metas I've ever seen. Don't say I didn't warn you. Do it here. Also, would be remiss if I didn't acknowledge the pretty relaunch of Amy Reynaldo's blog. Good stuff. 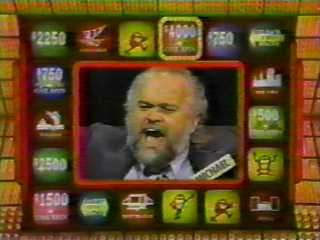 Lastly, if you haven't seen this already, there's a pretty amazing documentary about the "Press Your Luck" game show "scandal" detailing one contestant's cracking of the supposedly uncrackable-code used in the big board round. Simply fascinating. Part 1 (of 11) starts here.